Gaspari Nutrition Super Pump Max is a pre-supplement for people who want to increase endurance, recovery time and mental focus during workouts. This product is a convenient, good tasting powder that contains creatine, L-leucine, L-taurine and many other proven ingredients. It also contains a variety of essential vitamins and minerals to provide balanced nutrition. Athletes, bodybuilders and anyone who works out regularly can use this supplement to enhance performance and see improved results. 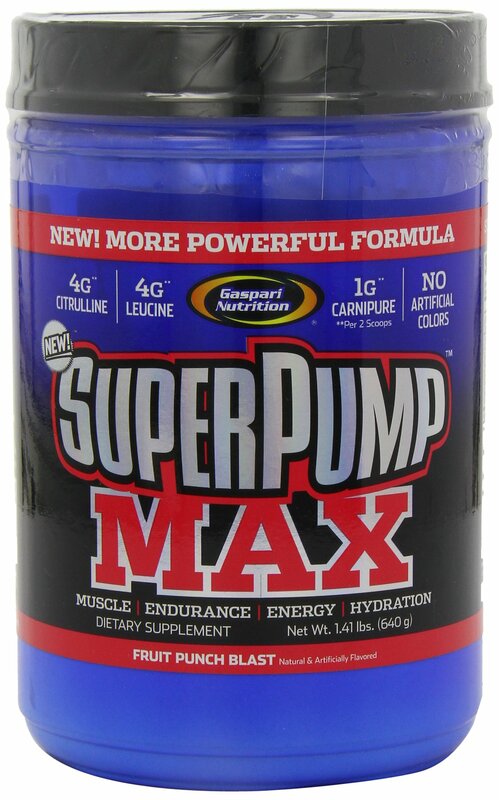 Gaspari Nutrition Super Pump Max has a list price of $64.99 but can be purchased on Amazon for $30.95 for a 1.41 pound container that contains 40 servings. Powerful Pre-Workout Supplement -Supports energy, endurance, strength and muscle pumps. New and Updated Formula -Original product has been improved based on the latest research. Provides Many Powerful Nutrients in a Single Supplement. Creatine, L-tyrosine, L-glutamine and many others. Wide Variety of Vitamins and Minerals -including Vitamins B6, B12 & C, niacin, calcium and magnesium. Fruit Punch Blast Flavor -Delicious taste makes it easy and refreshing to drink. This product is also available in other good tasting flavors such as Pink Lemonade, Refreshing Orange, Grape Cooler, Sour Apple and Blue Raspberry Ice. There are many nutritional and workout supplements on the market, but few contain as many laboratory-tested ingredients as Gaspari Super Pump Max. This pre-workout supplement combines amino acids, vitamins and minerals, caffeine and other ingredients that have been proven to support endurance, strength, recovery and muscle growth. Gaspari is a well-respected company in the supplements industry and their Nutrition Super Pump 250 was very popular for quite a while. This is a slightly revised and more potent version of that product, with changes made to reflect the latest research in the fitness and bodybuilding fields. People take supplements for a variety of reasons, but this product is effective for quite a few purposes. As the name suggests, it definitely enhances muscle pumps while you’re working out. That, however, is only one of the benefits. The caffeine, along with creatine and amino acids provide you with greater energy and endurance. Users also report greater motivation and mental focus for workouts. In fact, the CogniDRIVE Acceleration Matrix portion of the formula, which includes L-tyrosine, caffeine and glucuronolactone, is specifically designed to maximize alertness and cognitive function. In addition to enhancing athletic performance, it also aids with faster recovery. The Nitric OxiENDURANCE Complex, which includes L-carnitine, L-citrulline, beef extract and L-ornithine, supports both endurance and recovery. The recovery aspect applies not only to after your workout but also in between sets. This makes it easier to go from one set or exercise to the next without taking long breaks, another way to enjoy greater results. Gaspari Nutrition Super Pump Max is a proprietary blend of ingredients that work together to provide maximum support for athletes and people who exercise vigorously. This is a supplement designed for those who are serious about maximizing their progress in the gym. In fact, it’s recommended that you take a scoop prior to every workout for best results. As with all supplements, Gaspari Super Pump Max comes with some warnings and contraindications. The product does contain caffeine, which some people are sensitive to. It should not be taken by people who are suffering from chronic health conditions such as hypertension, heart, liver or thyroid diseases, diabetes or mental illnesses. It’s also not appropriate for women who are pregnant. Those taking prescription drugs should consult with a physician to make sure it’s safe to take this supplement. This is a product that should only be taken prior to workouts. It’s not appropriate for casual use or for people who are inactive. People who take workout supplements have a wide variety of reactions. There is no such thing as a supplement that everyone loves. Although the majority of customers praise Super Pump and say that it enhances their workouts, some users report that it doesn’t provide them with the energy, endurance and pump that they want. A few dissatisfied customers prefer the old Gaspari pre-workout formula to this updated one. Gaspari Super Pump Max is a powerful formula that can help you with endurance, muscle pump, mental focus and faster recovery times. Taking this supplement can allow you to have intense and productive workouts more and get more accomplished in less time. Many users of this product report that it helps them feel more motivated for going to the gym. Because it’s so effective at speeding up recovery times, you can get through your workout sessions faster. As with any supplement, you will find a variety of opinions and reactions to Super Pump Max. The only way to really find out if a supplement is right for you is to try it for yourself. If you’re looking for a good tasting, pre-workout supplement that combines many proven ingredients, this might be just the product you’ve been looking for.